Microservices is an architectural style in which large, complex software applications are composed of one or more smaller services. Each of these microservices focuses on completing one task that represents a small business capability. These microservices can be developed in any programming language. They communicate with each other using language-neutral protocols, such as Representational State Transfer (REST), or messaging applications, such as IBM® MQ Light. 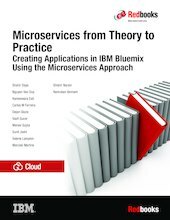 This IBM Redbooks® publication gives a broad understanding of this increasingly popular architectural style, and provides some real-life examples of how you can develop applications using the microservices approach with IBM Bluemix™. The source code for all of these sample scenarios can be found on GitHub (https://github.com/). The book also presents some case studies from IBM products. We explain the architectural decisions made, our experiences, and lessons learned when redesigning these products using the microservices approach. Information technology (IT) professionals interested in learning about microservices and how to develop or redesign an application in Bluemix using microservices can benefit from this book.